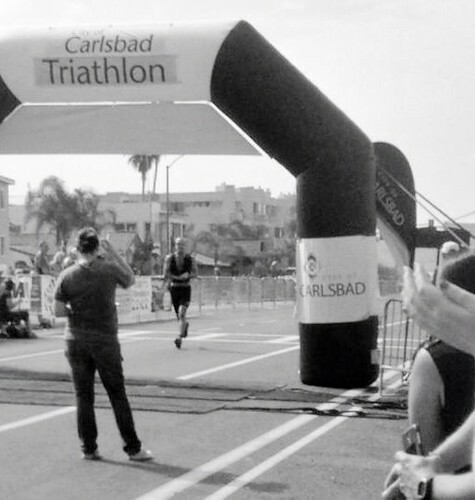 The Carlsbad Triathlon hails itself as one of the longest running triathlons in the nation, in its 31st year. For me it was the first of many. A fitting choice, I thought, due to the fact that it was relatively short, close to home, and flat. It didn't hint at any significant obstacles for the newbie, and it didn't disappoint. In a nutshell, everything came together as well as it possibly could for this event. For the few races I have been in, this was the most well organized, with plenty of friendly volunteers and positive vibes. I was able to get a few pictures as we were setting up in the transition area. It was a beautiful morning, with no wind and swells in the 3 ft. range. Transition area with bike and gear - Viva Slice! What were my expectations coming into the race? Well, I had lowered them significantly after my recent accident and injury. 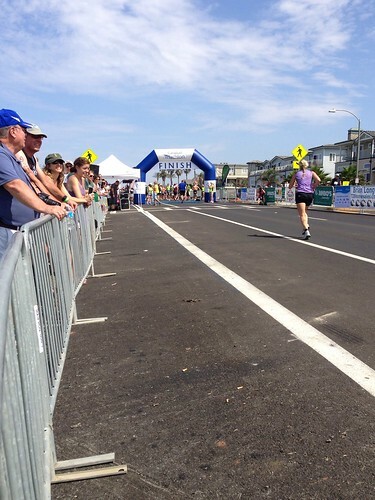 It was initially my ideal goal to finish the race in 1 hour 30 minutes. Again, this was ideal as it would have assumed quick transitions, a middle of the pack swim, a 20 mph avg. bike, and a nearly 7 minute/mile run. Pretty optimistic for a first time race. A few weeks ago I figured that would have been pushing it. After injuring my knee and damaging my bike, I figured I might miss this one, and if I raced, only do it for the experience without regard to time. Official race result: 1:29:05. There's something to be said for the healing power of aerobic training and healthy diet. I felt great during the whole race, with no pain, and surprisingly no soreness afterward. Below is my race report for this awesome race. As I've mentioned in previous posts, I have been most apprehensive about the swim. While I had the opportunity to do some open water swims in previous weeks, I still didn't know what to expect from a mass start. My fears had me lagging so far behind that the field of 35-40 year olds would start overtaking me. Fortunately we had arrived early and I had an opportunity to warm up swim around some of the buoys, which proved beneficial. I swam to the farthest buoy and was able to get my sighting for the turn, and was very comfortable in the water. Lining up for the start, my fears were replaced with prayers and meditation. A feeling of calm came over me as I realized that this was a celebration of all the work I had put in, and that I should just enjoy the experience. At this time I had my earplugs in, so there was an ominous quiet, which was quickly interrupted by the sound of the blow horn, signaling the start of the race for my wave. But was it my wave? I had a strange sensation at this moment that I was following the wrong group into the water. While I knew they all had purple caps, as did I (an indicator of age group and wave), that weird feeling had come over me. How embarrassing if I had actually run into the water with the wrong wave! But it just so happened that this was an irrational anxiety fueled by the excitement of the moment. I was right where I needed to be. And right where I needed to be was at the back of this competitive group of athletes, which included elites (professionals), firefighter olympians and 30-34 year old experienced triathletes. While they sprinted to the sea, I followed most of them into the water at a brisk jog, not wanting to get caught up in the melee. As soon as we all hit the water, though, a sizable set of waves started coming in and I ran straight into a wall neoprene and flailing appendages. Fortunately I am no stranger to the chaos of shorebreak, and took advantage of the opportunity to dive under the walls of water and begin the swim. Past the breakers, I looked to my front and back and noticed I was no longer trailing the masses, but probably at about the front third of the pack. 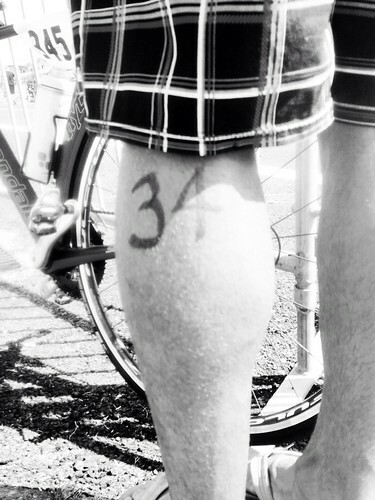 So began my swim leg. My pace felt strong (for me) and I was very comfortable, in fact at peace swimming in the ocean. I had found a nice little pocket which I had to myself following a few better swimmers. I experience very little contact, except for one person who seemed to be grabbing at my legs, but I started kicking and didn't hear from him again. Rounding the final buoy toward shore was a very eerie experience. We were going into the sun, so I saw silhouettes of other swimmers, and brief glimpses of cheering spectators separated by moments of quiet peace under the surface of the water. I exited the water and looked at my watch and was surprised to see 17:30 staring back at me. That was the fastest I'd ever swam 1 km. Transition went as well as it could, I got my wetsuit off very quickly, and was able to get out fast enough. There were lots of bikes still present, which told me I was still in good shape. However, as I took off my wetsuit, I also removed my timing chip (I didn't realize this until halfway into the bike). Fortunately, you only hit the timing mat exiting the water and exiting T2, so I was able to pick it back up after the bike. - Not sure, I was not very good with hitting my watch on time, but best estimate is about 2 minutes from mat to exit. I've never rode a bike soaking wet before after having just exited the ocean, so that was new to me. The bike portion was really great. Once I was up the hill and into aero position, I truly begain to recognize the benefit of being within the first wave, as we had the streets all to ourselves. The elite athletes were already well ahead of the pack, and the rest of us were scattered within our own little pockets. No real chance at accidental drafting here. My goal was to ride above 20 mph, and I didn't have much trouble doing so as I tried to settle my heart rate. I was trying to bring it down to the high 140's, but it was still maintaining within the 150's. However, I was feeling good so I didn't back off too much. I was passed by about 4 or 5 riders who were clearly in it to win it, so I let them go, but I was also able to pass a few riders myself, so I felt good about the ride.I probably could have pushed harder, but I'm not really training to sprint, I'm training for distance, so why risk injury? Expectations met. 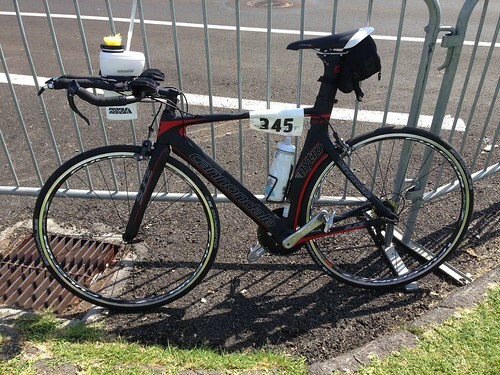 I finished the bike without a flat, without falling off, and without going the wrong way. - Garmin - 45:22, 21 mph avg. I was as quick as I could be getting off my bike and getting my running shoes on (and reattaching my timing chip), but I made a couple silly errors which cost me a lot of time. First off, after I was ready to go I struggled with putting me bib number on before I realized that I could actually start running while putting it on! Second, and far more costly, I started running the wrong way. Fortunately, nobody really noticed as I began trotting up the bike exit. It somehow came to me that the exit needed to be marked "Run Exit", so I began looking frantically for where it was (something I probably should have done while I was wasting time taking pictures before the race). I finally got my bearings and ran out the correct exit. I'm not sure what the transition time was, but as you can see, both transitions added about three minutes to my bike time. Ouch! My directional trouble didn't end in transition, as it was already in my head that I had gone the wrong way. Within a hundred yards of exiting transition, I noticed that nobody was in front of me (typically a good thing! ), and it made me question my direction. I saw what I thought was a racer walking up a steep hill toward the main street. This forced me to pause for about 20 seconds while I considered which way to go. A kind onlooker told me which way to go and I started back out. Fortunately, nobody had passed me at this point, so I was still in good shape, but there was a runner very close on my heels (as you can see in the video above - eventually he fell back). What you don't see in the video above is me being an idiot. Just as I leave the frame, I decide to do an Air Jordan flying leap in an effort to high-five Sarah (who is sitting right next to her Mommy). It probably looked much prettier in my head, but at least I landed okay and was able to continue racing. I was surprised with how high I got off the ground! I felt very strong in the run, and I let my heart rate go into the 160's. I would finish the race with my heart rate maxing out at about 178. I passed about three racers in the first mile and a half, and then settled in behind a runner, number 165, for a good part of the run. I have to say this guy was a class act, as he was cheering everyone on that was heading the opposite direction (after the turnaround on the way to the finish). He would not let me pass until about a half mile to the end when I hit the gas. I was able to pass him and another racer toward the end, but right at the final chute #165 passed me again, and I just couldn't keep pace. Well played, sir! My finish time of 1:29:05 put me at 18th in my age group (out of 71 athletes), and 128th overall (out of 737 athletes). 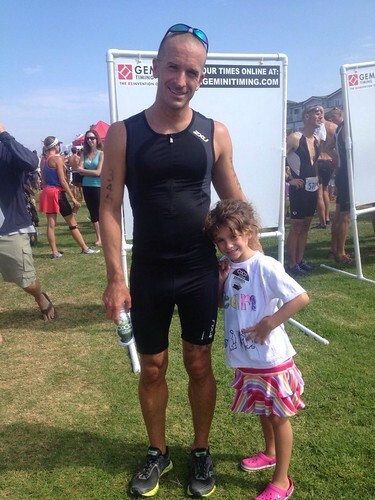 For a first triathlon, that makes me very happy, as I exceeded all my expectations and finished near the front of the pack. There is only room to improve from here, and I have reinforced that I really enjoy racing. Furthermore, I really enjoy training for these races. Next stop: Camp Pendleton, August 3, 2013.